Ants many times can be the worst pests of all. Anywhere in and around your house or business, including your lawn, walls, stumps, and under your foundation, are perfect nesting spots for ants. Yikes! No wonder they seem to continuously invade your home or business no matter what you try. Their colonies are ginormous, numbering up to 300,000-500,000…lets face it, that is a whole lot of ants. They can basically invade your home or office through any crack or hole. Generally they are seeking sweet or greasy food, or water, so closing lids, and cleaning up messes can help reduce the problem. What you need is an exterminator who will locate the nest location(s) and eliminate all the ants. 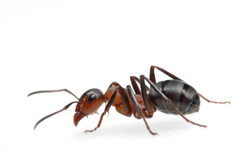 The professional exterminators are able to identify difference in ant species, which means they require different treatments. They are trained in locating their nesting location and terminating the colony.